I left the San Francisco Bay Area Friday afternoon (8/18) and survived the rush hour traffic getting out of there, adding two extra hours to an already long drive. 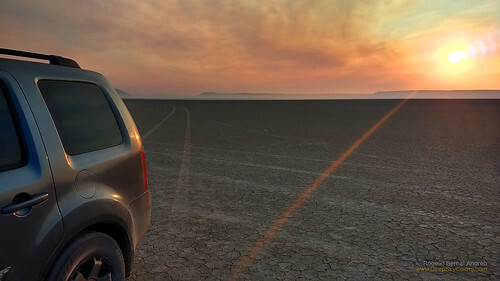 About 12 hours later I landed at Alvord Desert, where I had planned to spend the night and also take some shots, which I did! Saturday morning, after a quick breakfast in the middle of the playa, right after sunrise, I took a few strolls with the car (one's gotta do what one's gotta do) and I continued my journey into the totality path to my final destination, Phillips Lake in Oregon. 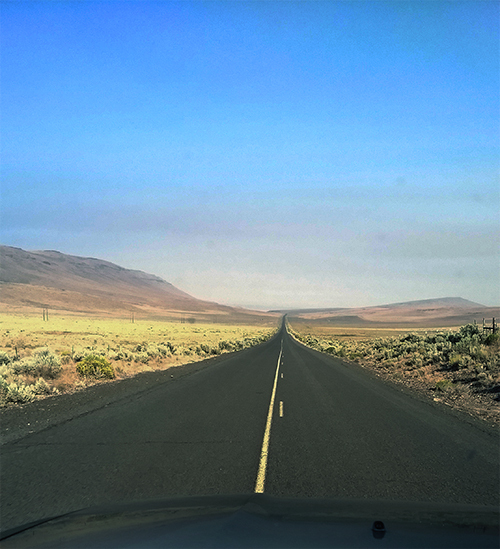 I was fearing traffic, but those back roads from Alvord Desert to Burns and up were mostly empty of any cars. I was somewhat surprised, but not that much, frankly. It really was the kind of ride you hope your car doesn't break down... Then, 50 miles before reaching Burns, my car... broke down! The radiator was leaking... Right in the middle of nowhere and, despite I was still about 3 hours from reaching my destination, it felt I was so close. It was a bad moment, as you can imagine. I managed to reach Burns by adding drinking water as coolant to the car every 20 minutes, which was the time it was taking for the coolant to nearly run out. Once in Burns, I tried a few tricks but nothing worked, and attempting a repair that'd get my car back on the road safely could leave me stuck in Burns for the eclipse. No way... 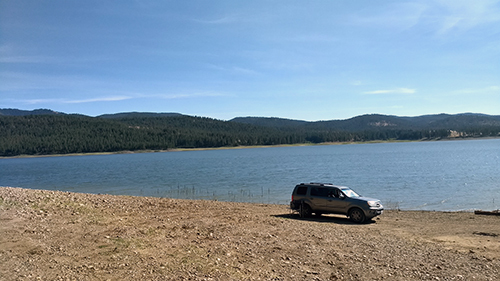 I was determined to reach my destination, and although I was still nearly 130 miles from Phillips Lake, I loaded some coolant in the car but continued driving, again adding water (not coolant) every 20 minutes, and again, and again ... and three hours later I finally arrived! Tenacity won the battle here, that's for sure. I was worried about crowds at Phillips Lake because of the eclipse but instead, I found the opposite. Just three cars plus two more that would arrive later. That was it. By the time I got there, the leak had gotten worst and it was running fast. I knew the only way out of that beach would be in a tow truck. It was Saturday afternoon, two days away from the eclipse, and I was stuck, yet, it didn't bother me a bit. In fact, I almost enjoyed knowing I was "trapped"! It's something difficult to explain but hopefully easy to understand. 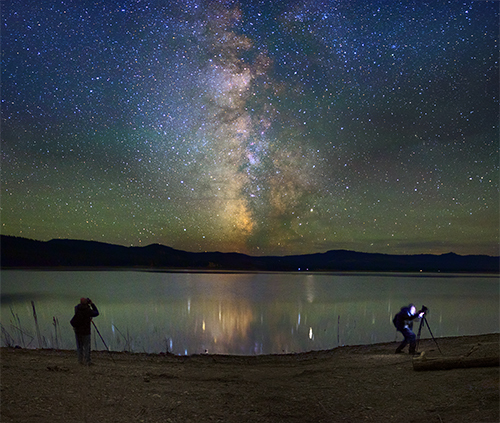 Saturday night a couple of friends, Fernando Cabrerizo and Domicio Carbajo, who came all the way from Spain to watch the eclipse from a campground in John Day just a 90 minutes drive from the lake, paid me a visit, and we had a nice night photo session right there by the lake. After spending some time with Fernando's gang at their campsite (thanks for the ride and hospitality!) all that was left for me was just waiting by the lake until the eclipse. 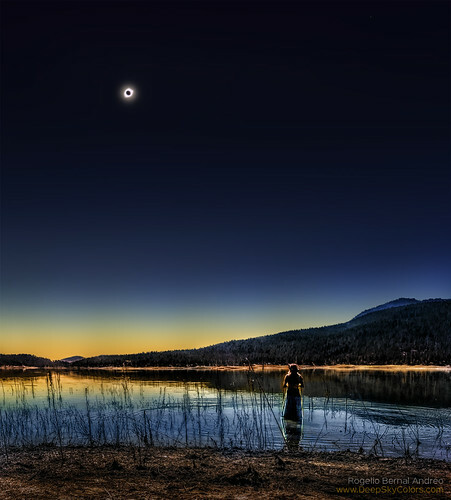 Every night I spent at Phillips Lake prior, during and after the eclipse, I was feeling that having this view right by my campsite was an amazing "filling" for the main event that brought me to this spot, no doubt. 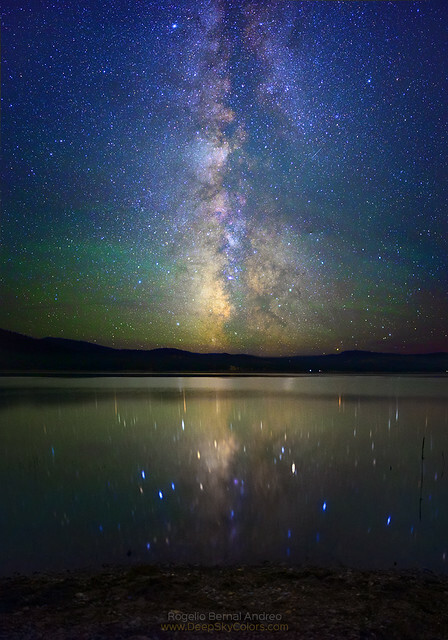 Each night I would walk a few steps and take a shot of our Milky Way reflecting on the lake, just like the one above. Monday morning arrives. Skies are all clear, with the soon to be eclipsed Sol shining bright! I notice a couple of guys heading in direction to the point I had planned to watch the eclipse, and moments later, Jessica and I also head in that direction. I set two tripods with cameras, my Sony a7S and my Canon 5d mk2. I prepare the intervalometers, settings and what not, then sit down and just enjoy the view there while I wait. It was showtime. Following is the only image I managed to capture during totality, and the piece I wrote to go with it. There were no crowds on this beach at Phillips Lake, an idyllic location at anytime. Just four strangers in a beautiful landscape otherwise void of people. It is Mother Nature and each of us, nothing else. Then... as the sun is half way gone, she starts to walk into the lake quietly. Pink Floyd's still playing, perfect soundtrack, again. Totality is imminent. We know what's about to happen... except we don't. The music ends but no one notices. The sky starts to darken. You catch a glimpse of a confused bird flying by over the lake. Your heartbeat is accelerating, you're breathing slowly and rushed. It gets cold, fast. And then, after a small breeze blows suddenly for a moment, a complete and chilling silence takes over. The whole scene... the lake, mountains, trees, the sky and us... Everything around us is at a frightening still, literally, in colors that don't belong. You're trembling. Then, as we are there not being able to make a move nor a sound just as everything else, within a split second the whole landscape falls apart right in front of you and then, unannounced, totality happens. She now says, very slowly, with a broken voice, nearly whispering: "Oh my god..."
There's a reason I don't even bother to describe totality. I can't. The closest I can get is by telling someone in person and that still wouldn't be even close. No words or pictures can describe the emotions, sights and feelings. For whatever reason, this surreal experience touches deep inside of us in a way we can't find words for it. After totality, we all spent a bit more time at that point. We shared some words but at the same time we could feel we were out of them, words... A while later but before fourth contact (when the Moon no longer covers the Sun), we all headed back to our cars. Within two hours, everyone was gone except for me, with my broken car, and an RV back in the distance, and I didn't leave until Wednesday. Surely many things happened during that time, or maybe nothing at all, but it was okay still being there, by the lake, eventually all by myself... another dip in the lake, another sunset, another glorious Milky Way... And I admit I was looking at everything in a different way, after hours earlier I had seen that same landscape like no other. At some point I also returned to the spot where it all happened for me and again, it now felt weird and unreal in a different way. It wasn't weird or unreal because of I was seeing, but because of what I had seen before, right there. Once again, words fail me. 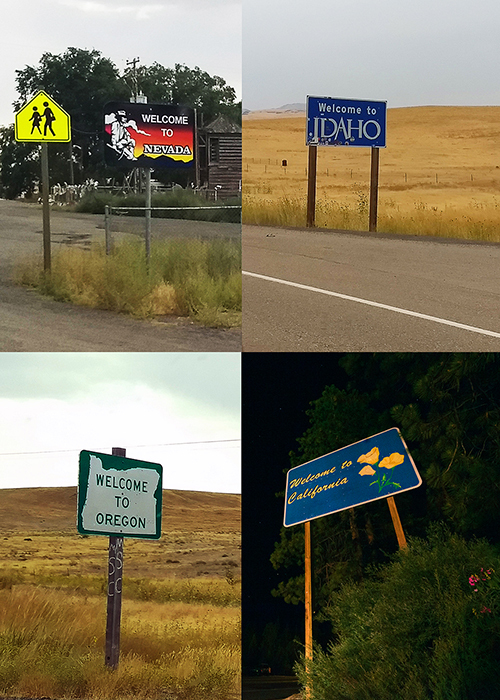 Eventually I got my car towed to and fixed in Baker City within a day, enough to get me back on the road at least, and 11 hours later, after crossing four states, you could say on Thursday already (6 days before I left) I was back home, safe. Unknowingly, a lake I might have not ever visited otherwise (it's just too far from home), became a landmark in my life, a beach I will always remember as the place where I saw and felt the most out-worldly experience I've ever had. My only, and huge regret is that I did not take my family with me - the memory would have been so much more memorable and they would be carrying the same experience with them as well. This is something I hope to amend on a coming eclipse if I live for it and have the means to chase it. In case you're wondering, yes, there's one more total eclipse chaser in the world. Thing is... after this eclipse I think there's also many more. How could one not be? "The Great Gig in the Sky" wasn't a staged or scripted shot. There were no sponsors, no planning, no praying that everything would work... No, I'm not talking down the hundreds of amazing and carefully planned shots that so many people have produced of this eclipse. I'm a seasoned astrophotographer. I've done literally hundreds of planned shots during my ten years shooting at the night sky. I've produced images (deep-sky mostly) that take months to produce, so I know about planning, persistence, precision, patience and technique... I've been rewarded for it, I do talks and workshops about it... and I love it! I mention it because not being a staged or sponsored shot, there was no making-of crew on site, no videos or behind-the-scene shots that I could share with you. To be honest, if there had been someone there doing just that, the whole thing would have been so vastly different. But yeah... Many people had been telling me to go for the experience, to forget about pictures, but when you're a photographer, an astrophotographer... you can't just go on an eclipse trip without a camera! Needless to say, I had never shot a solar eclipse before, total or not, and my plan was simple: forget about doing my homework, just go for some landscape shots, not closeups, and have a ball. That's why you're going to a lake after all! For the scenery! By the way, about Jessica, the young woman in the picture... we didn't exchange contact information other than first names and me giving her my Instagram account, but I'm not aware she has started following me or that she has seen the image. If you happen to know a woman named Jessica who went to Phillips Lake in Oregon for the eclipse, please send her to this page! UPDATE 9/4/17: Jessica found my Instagram account, so she was finally able to see herself in the picture during that moment! Back to the story, that's what I set my rig for prior to the eclipse, landscape shots. Two full-frame cameras, a Sony a7S with a Canon 70-200mm lens, the other one a Canon 5d Mk2 with a Rokinon 24mm. I did take some shots through a solar filter with the a7S, but they weren't coming out very sharp at 200mm, and I didn't sweat it. Interestingly, I neglected the Canon for the entire time before totality. Totality... The instant it happened I was caught off-guard. I was staring at the landscape around me, not at the sun, so it came unannounced. And the last thing I could think at that moment was to go take a shot. It's not that I forgot, it's that all my attention was drawn into the eclipse and how our Earth - and us! - reacted to it, in an unbelievable sensory overload. Still, as my mind started to settle a bit, still mesmerized, at some point I remembered about the cameras. Approaching the a7S with the 200mm didn't even cross my mind. I went directly for the Canon and the wider angle... I had set the framing, focus and settings beforehand and simply took one shot without double-checking anything. It was just a two seconds exposure. After that, I checked the framing, realized I hadn't captured any landscape, just sky, and I pointed the camera down a bit (hoping for a 2-pane mosaic of sorts) and took another 2 seconds shot, this time mostly getting the landscape. During that quick shot, third contact started... This is not something I noticed at the moment. In fact, the instant I pressed the shutter for the second time, I forgot about the cameras again, completely. I had taken two shots and that was that, I didn't even bother to wait and check. It was an hour later after looking at the images more carefully that all made sense. A couple of minutes after totality, when we were all brought back to the real world, I honestly didn't think I had captured much. I knew I had something but likely nothing more than a personal souvenir. I didn't even bother to re-check the shots until later, back in my car. When I finally did, seeing the shot with the landscape got me intrigued. It felt a tad too bright and I wasn't sure whether that would combine well with the much darker shot of the sky during totality. It was only several days later, when I finally returned home and everyone was already sick of seeing eclipse pics on social media, that I got to build the mosaic and be like "it works!". And for me, it absolutely does. I also know the image wouldn't be even half of what it is if it wasn't because Jessica walked in the water just in front of me, adding that powerful human touch to the image, and while she merely did what she felt like doing, now I'm very happy that she did. The aftermath of the experience is something I have difficulty writing about. As for the "gig" image...I've captured hundreds of night shots at places that have left me speechless - from remote beaches in Moloka'i or glowing volcanoes to the darkest skies in the continental US or moonlit "firefalls" - and many of these images bring me back to those places, those moments, every time I see them. 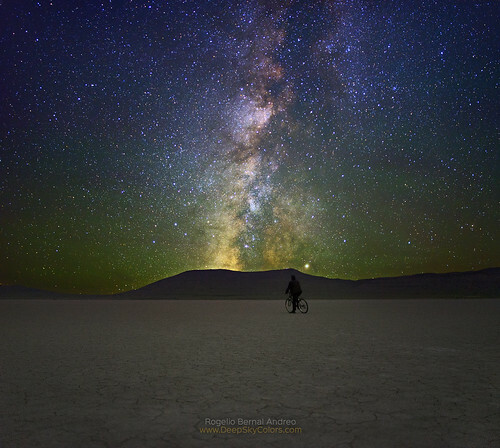 Yet, "The Great Gig in the Sky" is an image of one of the most surreal moments of my life, and for some reason, it transports me back like no other image I've captured has ever done. I could blame it on the emotions being so strong, so it's easy to relate, but at the same time, the emotions were so rare, so unfathomable, that IMHO it took a very special image to bring them all back. It was probably the most widely viewed and shared celestial event in history. This was my bit. Making-of my three "moonlit firefall" images. That's the famous Horsetail Fall in Yosemite, but unlike the well-known effect caused by sunlight, here the effect is caused by moonlight. Behind the scenes and a load of information about my image of the Andromeda Galaxy that also shows never-seen-before red-glowing hydrogen clouds "around" it. Thanks a lot Sharon! Most appreciated and very happy that you like it! The 10 hour drive home was uneventful. No speeding tickets and the old '91 S-10 Blazer ran great. Those pictures are so sensational and amazing. You have got mad astrography skills, that picture with stars and the solar eclipse was the best pictures I have seen today. Thanks for sharing and keep up the good work.